Before our passes expire each year, Chris and I sit down and have an honest conversation about renewing. 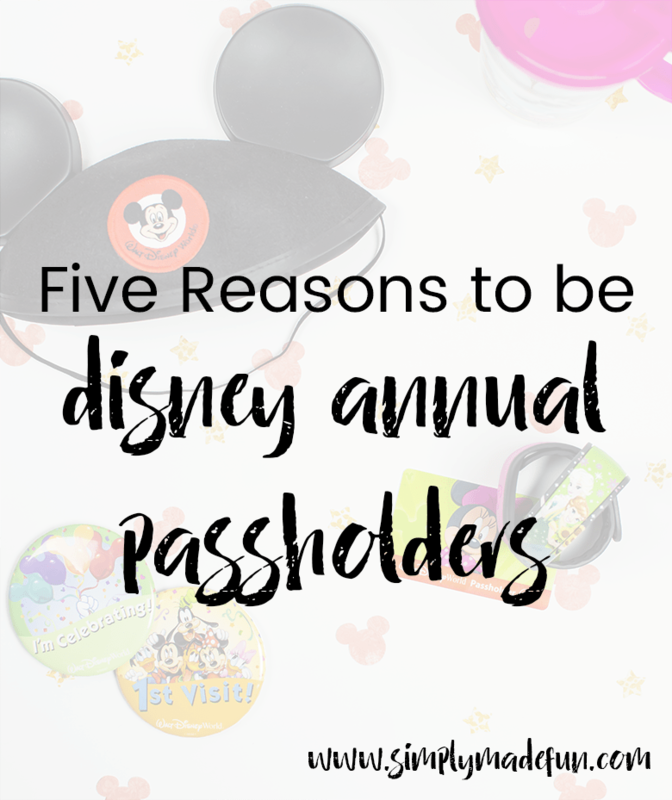 These are the reasons we continue being Disney Annual Passholders year after year, and why we think it’s worth the investment! For the past four years Chris and I been Disney annual passholders and love all the perks that come with the passes. As part of our Disney wedding package they give you annual passes for the year, something Chris and I were unaware of when booking our wedding through Disney but once we found out we were really excited! We love any excuse to visit Disney as often as we can, and with the passes we took full advantage of them and went four times that year (and every year since!). One reason we keep renewing year after year is because of all the perks that come with our passes. For every trip we take Chris and I save a few hundred dollars between resort and merchandise discounts. Which is great, because I can never pass up buying a few souvenirs each time we visit Disney (it’s a problem!). Are you considering investing and becoming Disney Annual Passholders? Let me tell you why these perks totally make it worth it! One of the reasons Chris and I can afford to go to Disney as much as we do is because of the great discounts on rooms we receive just for being Passholders. Depending on the season you can expect anywhere between 10-30% off select nights at Disney as long as you book your room a little bit in advance. The more expensive the resort the bigger the discount, which is fantastic if you want to stay at one of the Deluxe Resorts on property! Chris and I tend to stay at the Value Resorts for most of our stays, unless it’s a special occasion (like our gender reveal or wedding anniversary!). We also always go during off-season too (no summer stays for us!) which means our room rate is always under $100 a night at a value resort. We figure that we only really use the rooms to sleep in, and would much rather have more money to do fun things at the parks instead of spending it on an expensive room! With parking being $20 at each park ($22 for trailers), that can add up pretty quickly. Staying on-property gets you free parking (if you’ve brought a car) but if you decide to stay off-site, your annual pass still allows you to get in and park your car for free. That’s an $100 savings if you are going to the parks for five days! If you’re park hopping, make sure you keep your parking receipt in your car because you’ll only have to pay to park once a day if you can show them your receipt! During certain events, Disney World offers souvenirs that only passholders can buy. For Star Wars events there were t-shirts and other types of merchandise that were only for passholders and you had to show your card to be able to get those items. Chris and I love to stock up on those passholder-only items because they’re a fun way to remember the event by! I think we have shirts from every Star Wars event that Disney has put on (they even have May the 4th shirts! ), and they also have passholder only magic bands and other little trinkets you can collect. Something new this year is the inclusion of photopass photos with the purchase of an annual pass. This is something I am so excited about since our little one is finally here, so we will be able to get some great family photos while at Disney. Photopass photographers are located all around the parks, always ready to take family photos for you to take home as keepsakes! Instead of buying the memory maker for each Disney trip you take, you’ll pay one yearly fee as Disney annual passholders and are able to use the Memory Maker for every trip you take! Let’s be honest, gifts from Disney can be fairly expensive. Especially if you want all the things like I do! With an annual pass you can receive 15% off all merchandise purchases, which can come in handy if you want one of those amazing Thomas Kinkade paintings! Another way you can save on merchandise is to buy before you go, and I’ve seen a ton of people do that and surprise their children each morning with new gifts from Mickey and the gang. I love that idea as well! Are you Disney Annual Passholders? What is your favorite passholder perk? UPDATE: This post has been updated to reflect the new 2016 Disney prices and new perks that come with being Disney annual passholders.